Press Digest: Refugees stream into the Rostov Region; Normandy meeting? RBTH presents a selection of views from leading Russian media, featuring news on the developing refugee crisis in southern Russia, the possibility of a meeting between Ukrainian president Petro Poroshenko and Vladimir Putin at the 70th anniversary commemoration of the D-Day landings in Normandy, and trouble brewing over the Ukrainian constitution. The Kommersant newspaper says that the authorities in Rostov Region have declared a state of emergency in the region, because of the massive influx of refugees from Ukraine. Internally displaced people, the newspaper writes, have fled from bombing and military action. In the last 24 hours alone, according to Kommersant, a record number of Ukrainian citizens have crossed the Russian border – more than 7,000 people. 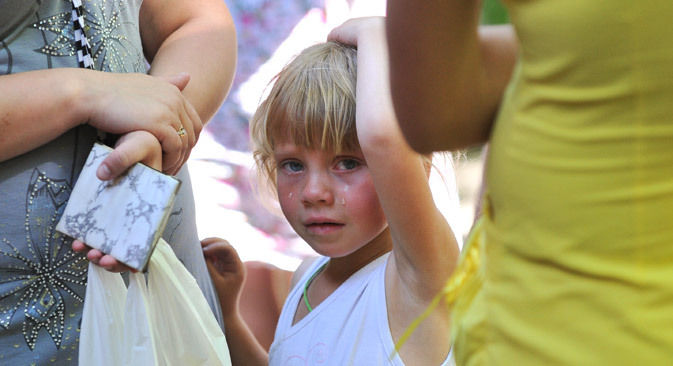 The publication tells its readers that volunteers and representatives of public organizations are taking in people from Slavyansk, Kramatorsk, Luhansk and Donetsk, where the fighting continues. People arrive in groups of 90–100, and Kommersant notes that these are mostly women and children. The influx of refugees from Ukraine to Russia has increased markedly since the end of last week, when the Ukrainian army began the next active phase of its “anti-terrorist” operation. Therefore, the newspaper predicts that in the near future, the influx of refugees will only increase. In addition, Kommersant reports that the Russian Investigative Committee has announced that a criminal case is to be opened “in relation to crimes against humanity in the southeast of Ukraine,” which will be assigned to a special group of investigators for investigation. Poroshenko himself, the newspaper notes, playing the role of a national leader, said that at his inauguration he would announce plans for a broad amnesty and decentralization of the country. In addition, the possibility of a Russian-Ukrainian summit is currently being considered. The meeting of Russian and Ukrainian presidents, according to Expert, could take place, for example, in Normandy, where, on Thursday and Friday, Vladimir Putin will take part in activities celebrating the anniversary of the opening of the second front in World War II. Nezavisimaya Gazeta writes that a political crisis associated with the adoption of the new constitution is brewing in Ukraine. The newspaper reminds its readers that immediately after the change of government, politicians temporarily brought into force the 2004 constitution, and promised the public to approve it in a new version this fall. However, an agreed-upon project, says Nezavisimaya Gazeta, still does not exist, and the main backstage disputes and scandals raise the issue of the distribution of powers between the president and parliament. “In Kiev, they do not rule out that this issue will lead Poroshenko to dissolve the Verkhovna Rada,” emphasizes the newspaper. The 2014 constitution was intended to involve the decentralization of power, meaning a reduction in the influence of the center and giving broad authority to the regions. As Nezavisimaya Gazeta clarifies, the text of the constitution, as a complete project, still does not exist.